Gramercy Smiles Holistic (New York) - Book Appointment Online! There is a new mentality prevailing in today's culture. People are becoming much more aware of their health and wellness. More and more of us are eating organic foods and exercise regularly in order to prevent disease. Here at Gramercy Smiles we take a holistic approach to dentistry focusing on the person as a whole and not just your teeth. The staff was so nice & easy to talk to! Everyone was very attentive and made my first experience very comfortable! Honestly the best dentist I've ever been to. Great at explaining stuff. My cleaning and filling replacement were easy and quick. (The dental hygienist was a revelation.) A++++ would highly recommend. 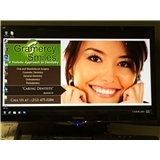 I went Gramercy Smiles for a cleaning and exam, and Dr. Azizian was fantastic! She is very friendly and professional. I also had a great experience with Julia, the dental hygienist. Highly recommended.